I TELL you, no! I will not keep this miserable donkey another day!" Nasr-ed-Din Hodja glared at the little gray donkey that was patiently switching off the myriad flies as it waited for the Hodja to fasten on the piece of old rug that served as a saddle. "A new donkey might be just as stubborn," suggested Fatima. "This wretch is more than stubborn!" stormed the Hodja. "It eats like an elephant but grows skinnier every day. It is slow as a tortoise, lazy as a pig, mean as a fox, stupid as a fish, and stubborn as a - as a - as a donkey!" Fatima patted the little donkey who rubbed its head affectionately against her striped sleeve. Fatima said nothing. She had argued with her husband enough times to know that it was like throwing dry leaves on a fire. "Say your good-byes to the creature!" Nasr-ed-Din Hodja threw one long leg over the little animal. He made the low throaty "Ughr-r-r-r," which is marching orders to a Turkish donkey. "Next time you see it, someone else will be riding it. You shall see what a fine donkey I shall ride home fron the animal market. You know how good I am at buying and selling. I can sell this wretched donkey for enough to buy a fine one and still have a gold piece left over for you sew in your headdress." "Ughr-r-r-r," he whirred to the donkey again. The little animal reluctantly shook its long ears, picked up one tiny hoof, and was off. Gloating over the great bargain he was to strike in the market that day, the Hodja patted the coarse hair of his donkey's neck. Through the street gate rode the Hodja and on toward the market place. His long legs dangled at the donkey's sides, his feet sometimes touching the cobblestones of the narrow street. It was hard to pass by the charms of market day, but the Hodja had important business on hand. He nodded to right and to left at his many friends in the market place, but kept straight on until he reached the animal market. 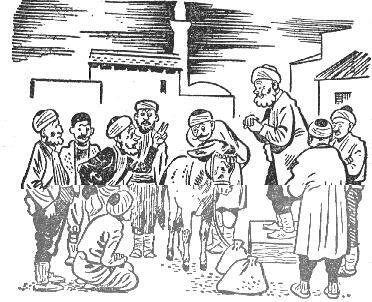 "Here is a donkey that will make some man proud of his bargain," said the Hodja as he handed the donkey over to the auctioneer. "Such a good donkey should bring a good price," said the auctioneer. He poked the donkey, pinched its legs, and looked at its teeth. Like the Hodja, he spoke loudly for the benefit of anyone who might be listening. One after another, the auctioneer led the animals up for sale but not a bid did the Hodja make. His eyes were fixed on one donkey that was bigger, sleeker, and plumper than the others. Surely that was the donkey for him. Finally, all the donkeys were sold but two - the one Nasr-ed-Din Hodja had brought and the one he had resolved to ride away. He was relieved to see that the auctioneer led up his old donkey first. It would be good to have the money for his sale jingling in his belt with what money he already had before he started bidding for the beautiful dark donkey on which he had set his heart. "Here is a donkey worth buying!" The auctioneer rubbed his hands gloatingly as he set the Hodja's old donkey before the little group of buyers. "I have watched this donkey many a time and wished it was mine. See that wise look in its eyes! See the gentle way it holds its head! One look at this donkey shows that it would obey your orders before you gave them!" Nasr-ed-Din Hodja looked at the donkey's eyes. There was a wise look he had never noticed. "And look at the muscles," the auctioneer droned on. "What loads it could carry! What hills it could climb! Those slim legs mean speed. I wager this donkey could run faster than any donkey in Ak Shehir!" The Hodja looked at the donkey's legs. He had never noticed how strong and slim they were. "See how smooth this donkey's coat is!" said the auctioneer. "That shows good care. What a pretty shade of gray! What perfectly matching white boots on its feet!" The Hodja squinted thoughtfully at the donkey. It was prettily marked. Strange he had never noticed. "How much am I offered for the handsomest, strongest, wisest, gentlest, most industrious donkey in all Ak Shehir?" "Fifty ghurush," offered a villager. Nasr-ed-Din Hodja glared at him. Fifty ghurush for the finest donkey in Ak Shehir, indeed! "Two liras," called the Hodja. Up and up went the price until a villager bid ten liras. "Wait a minute!" called the excited Hodja. He grabbed his money bag from his belt and counted his money. Just what he thought! Ten liras and eleven ghurush. "Ten liras and five ghurush;" called a villager. "Ten liras and eleven ghurush," shouted the Hodja. "Only ten liras and eleven ghurush for this wonderful donkey!" exclaimed the auctioneer who knew perfectly well that was a good price. "Come, someone! Make it eleven liras." The auctioneer handed the bridle to Nasred-Din Hodja. The Hodja emptied his money bag into the auctioneer's hand. He threw his long legs over the donkey's back and settled into the familiar saddle. "Ughr-r-r-r," he whirred to the donkey and off they trotted toward home. How proud of his bargaining Fatima would be! Halfway home he began wondering why he had an empty money bag. He had planned, by good bargaining, to bring home a donkey and more money than he carried away. It was puzzling. Perhaps Fatima could explain.